Since there's polls for your favorite guitar and bass, I figured I'm make one for amps. Your amp is far more important to your overall tone than your guitar. Get hip. My vote goes to my Bad Cat Hot Cat 30 as my favorite amp to play. any tube head under a thousand bucks.I refuse to vote cause I'm not lumping that in with the Peavey/Crate lower end tube category. Sovtek is a good amp (I used to own a Mig 100h), but it is a lower end amp. I mean, I paid $300 for mine NEW. Sorry bro. 6AM wrote: Sovtek is a good amp (I used to own a Mig 100h), but it is a lower end amp. I mean, I paid $300 for mine NEW. Sorry bro. I always liked Fender tube amps but the Line 6 Flextone II XL HD solid state still impresses me, very versatile...live or studio with any cab configuration and amp modeling. Don't play guitar, but a majority of my favorite players (tone-wise) play Vox AC-30s, so call this a vote for them. 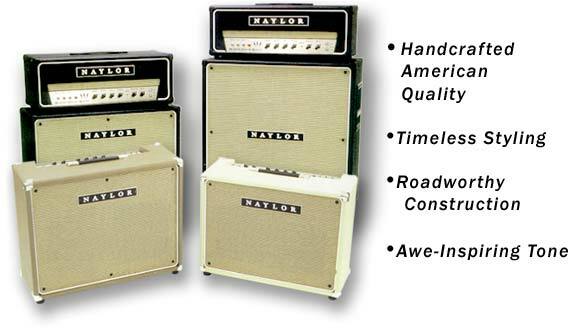 I voted on behalf of my dream amp, a naylor. right about now id settle for any model, but id really like either a super drive 60, duel 60, or elctra-verb 60...of course with a matching 412 cab! And lucky me, THEY'RE BACK IN PRODUCTION!!!! That ol' DC 300A Series II still kicks! Now who is going to ask about Pre Amps? Remember, life is a sexually transmitted disease! The "Male Morning After Pill" How does that work? Last edited by Dobro on February 20th, 2004, 9:05am, edited 1 time in total. vintage Hiwatt or Orange. I own a Hiwatt, played through an Orange, and wouldn't play through anything else. The Kid wrote: vintage Hiwatt or Orange. I own a Hiwatt, played through an Orange, and wouldn't play through anything else. I voted for "Fender whatever", I assume that includes vintage Fender. I own a '73 Silverface Twin Reverb and it rules. For more metal-like applications you can't go wrong with Marshall. I wish I had the money to play around with boutique amps, that'd be sweet. what the frigg is that?